HDR (High Dynamic Range) is a technology that is increasingly common and popular in display devices such as TV and monitors, mobile devices such as Android and iOS, and content such as photos, images, videos, 3D rendering and sound recordings. HDR expands the range of color for higher color precision, brightness level and contrast to bring more vivid colors, wider color gamut and palette, better depth, brighter bright, dimmer darkness, and higher contrast. If you have a display device or monitor that supports HDR, Microsoft has included the support for HDR video playback since Windows 10 Fall Creators Update. With Windows 10 Spring Creators Update, Windows 10 is able to use medium- to high-end models of regular SDR (Standard Dynamic Range) screens or monitor with high brightness to view HDR optimized videos. Windows 10 HDR support allows you to enjoy better quality HDR contents and videos, including movies and TV series from streaming services such as Netflix, Hulu and more. This tutorial shows you how to enable and activate the HDR video playback, even when you’re not having a HDR monitor but have a medium- to high-end monitor which Windows 10 determined to be able to improve the quality of HDR content. Navigate to Apps -> Video playback. Toggle Stream HDR Video to On to enable and turn on HDR support. 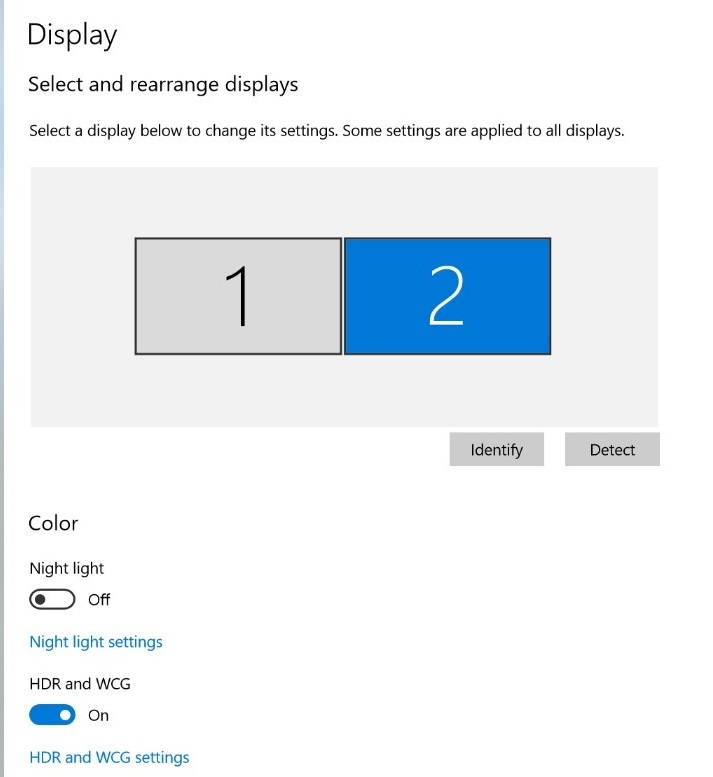 Note that this option will be greyed out if you don’t have HDR capable display device or have a SDR display device which Windows 10 determined to not fulfill HDR playback requirements and hence Windows 10 could not optimize the HDR content further for the display. However, you can choose to enable Automatically process video to enhance it to allow Windows 10 to try improving the content quality by using computer hardware such as graphics card. Once you activated the HDR video streaming support in Windows 10, a link will appear that allow you to calibrate your display for HDR video. Navigate to System -> Display. Select the external display that you want to enable the HDR support. Toggle HDR and WCG to On to enable and turn on HDR support on the external display. Note that this option is not available is the external monitor is not supporting HDR. HDR display or TV must support HDR10 and DisplayPort 1.4 or HDMI 2.0 or higher. Recommended DisplayHDR certified displays. Windows 10 PC needs to have a graphics card that supports PlayReady 3.0 hardware digital rights management (for protected HDR content), e.g. NVIDIA GeForce 1000 series or higher, AMD Radeon RX 400 series or higher, or Intel UHD Graphics 600 series or higher. Recommended a graphics card that supports hardware-accelerated 10-bit video decoding for HDR video codecs. Windows 10 PC must have the required codecs installed for 10-bit video decoding, e.g. HEVC or VP9 codecs. Have the latest WDDM 2.4 drivers installed on Windows 10 PC. The streaming video app is playing full screen on an HDR display as Windows only supports HDR on full screen mode. Battery saver is turned off; or alternatively, clear the “Lower screen brightness while in battery saver” check box on the Battery screen, as Windows needs to be able to set your display to the maximum brightness level. 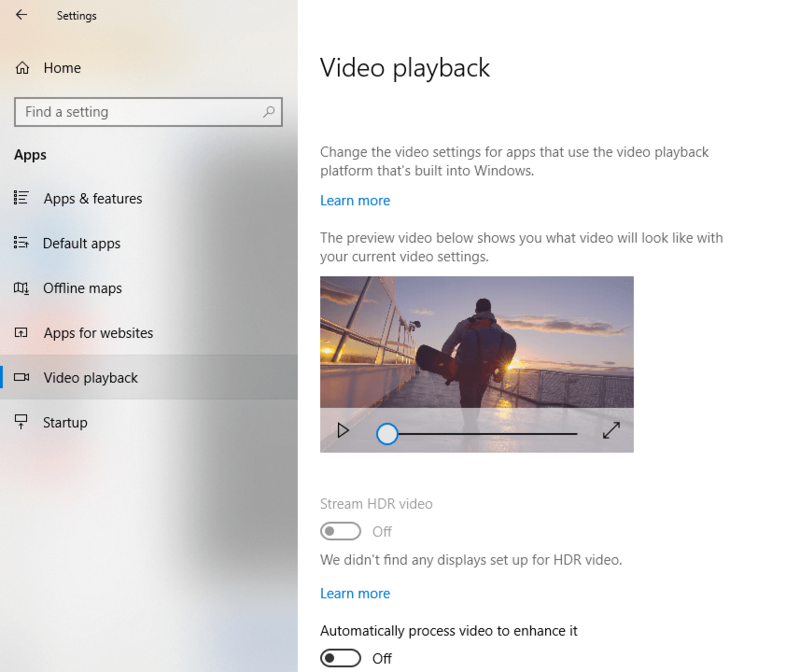 You’re using a supported app as streaming HDR video is supported only in certain apps that use the video platform that’s built into Windows 10. These include Universal Windows Platform (UWP) apps that come with Windows 10, such as Microsoft Edge, Photos, and Movies & TV, as well as many third-party video apps you get from Microsoft Store (for example, Hulu, Netflix, and Vudu).